Your accreditation badge (Festival, Marché or Press) gives you access to the Festival zone and to the screenings (Official Selection, parallel events and/or Marché du Film depending on your accreditation category). Badges are nominative, non-transferable and must be worn so as to be visible in order to facilitate ID checks. In the event of loss or theft, please contact the late accreditation office. Beyond the Palais des Festivals and the Riviera, the Festival Zone stretches from the International Village Pantiero to the International Village Riviera up to the Cinéma de la Plage. The Festival zone is accessible for accreditation badge-holders via all entrances from Tuesday 14 May to Saturday 25 May. The Marché du Film is open from Tuesday 14 May to Thursday 23 May. from 8.15 am for screenings scheduled at the Palais before 9:00 am (door on the right). Mediterranean Entrance: accessible to accreditation badge-holders from 8:30 am to 12:30 am. Jetée Albert-Edouard Entrance: accessible to accreditation badge-holders from 9:00 am to 6:30 pm. Location: Palais, Level -1, between the tourist office and the main entrance to the Palais. Opening hours: 13-15 May 2019 from 8:00 am to 8:00 pm, then 16-24 May (23 May for Marché du Film) from 9:00 am to 6:00 pm for Festival and Marché du Film accreditations. NB: Reception area for late accreditations, Marché du Film and Festival: 13-24 May, 9:00 am to 6:00 pm. In the "accreditation" zone, a number of assistants are on hand to guide you. If you lose this document, you may obtain a duplicate from the late accreditation office. You can pick up your Festival or Marché du Film bag at the counters facing the accreditation area on presentation of your badge. Depending on your level of accreditation, your bag will contain the official publications of the Festival or the Marché du Film. Express courier service for parcels and documents. Entrance Level - 1. 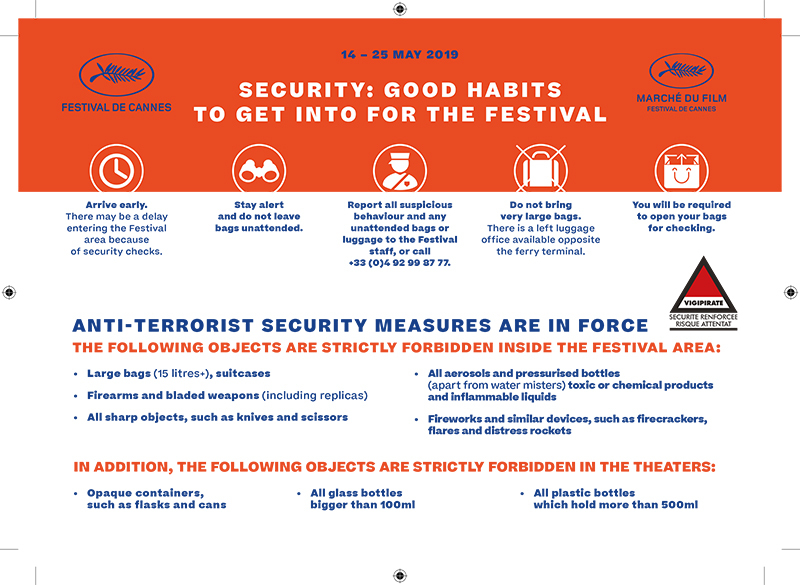 Security checks are in operation at the entrances to the Palais and the Riviera in application of the French Vigipirate plan. We appreciate your cooperation with these measures to ensure the safety of all, and ask you to take into account the possible delays that may result in getting from place to place. Security checks are in operation out at all entrances to the Palais and Riviera as part of the Vigipirate plan in place across France. We appreciate your cooperation with these measures, which are designed to ensure the safety of all our visitors. Due to the likely delays caused by these checks, please allow for extra time when moving from place to place, and take note of the recommendations below.